Good afternoon from El Segundo, Insiders. Let’s get down to brass tacks. -In other words, there were no changes in forward lines (or, for that matter, defensive pairings). The team took the ice prior to 10:00 a.m. and stayed on for the better part of an hour. 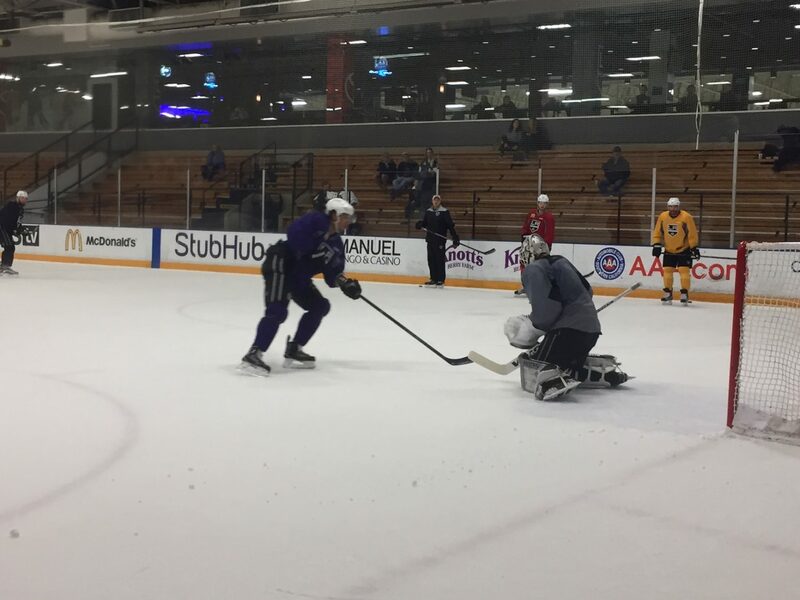 Because of yesterday’s day off, there were a good amount of skating and transition drills that segued into 3-on-0 rushes and finally concluded with some around-the-net battle and compete work. For a skate that followed a recovery day, it was a mostly typical practice. -After some Darryl Sutter quotes, I’ll post a story on Teddy Purcell, who has two assists in 12 games and has been a healthy scratch in the last two. One question I asked him is if the Kings are asking him to play any different way than how he played in Tampa Bay, Edmonton or Florida. He answered: “those teams haven’t won in the past X number of years and they have here, so they have their philosophy and obviously it works, so I’ve just got to try to do better at it and gain their trust.” In addition to several particulars about his play, he also mentioned confidence as an area that he’s looking to build up. -Tomorrow’s opponent is San Jose. The Sharks face the Coyotes at the SAP Center tonight, and Martin Jones is getting the nod. Might Los Angeles see Aaron Dell (who has stopped 95 of the 102 shots he’s faced this season) at Staples Center? Let’s talk tomorrow.